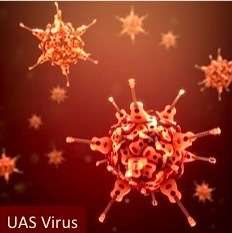 UAS Has Reached Pandemic Proportions. Studies have shown that playing the ukulele dramatically increases the risk of UAS, or Ukulele Acquisition Syndrome. UAS manifests itself in the insatiable need to own “just one more” ukulele. Here is a photograph of the viral capsid of this insidious disease. The UAS virion is similar in appearance to that of Guitar Acquisition Syndrome (GAS). It is however, smaller and carries two less strands of viral RNA. Despite similarities, sufferers of UAS are quick to point out that UAS is not merely a smaller version of GAS. Although the symptoms of UAS can be moderated in some cases, through the application of strings, tuners, or other ukulele accessories, there is no cure. “How dare you trivialize my condition”? Get involved with a ukulele club. Try to spread the UAS virus to as many people as you can so that they won’t look at you funny or make your credit card mysteriously disappear, and most importantly, feed the addiction. Remember, Ukuleles are cheaper than therapy. Contact the Ukulele Psychologist. It’s free. Click here. The more UAS sufferers, the better. This way, your significant other won’t think you’re an isolated case; you can tell him or her that you’re just one of many who can’t stop.